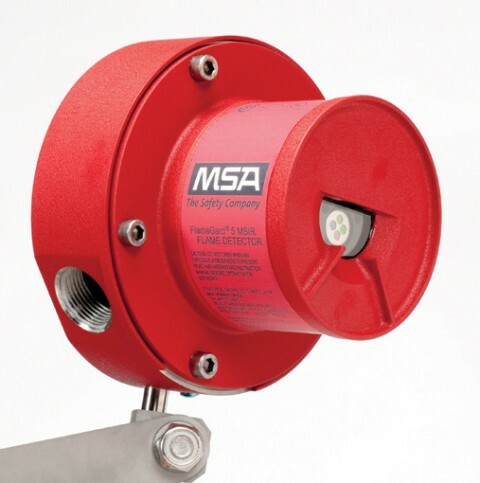 The FlameGard 5 UV/IR Flame Detector is designed to detect fires and provide alarm outputs directly from the detector while maintaining false alarm immunity. The FlameGard 5 UV/IR-H2 detects hydrogen fires. The two models detect fires by monitoring in both the ultraviolet and infrared (UV & IR) spectral ranges, making it highly immune to false alarms caused by lightning, arc welding, hot objects and other sources of radiation. The electronics of the FlameGard 5 UV/IR and UV/IR-H2 detectors are housed in an aluminium explosion-proof enclosure (Stainless Steel optional). The Modbus and HART outputs provide alarm status, fault and other information for operating, troubleshooting or programming the unit. HART enables this feature without the need for rewiring. The continuous optical path monitoring (COPM) self test feature checks both the optical path integrity (window cleanliness) and the de tector's electronic circuitry once every minute.